This makes either a wonderfully accompaniment or it can be served as a delicious starter. Of course, with this recipe you can vary the toppings adding cooked prawns, cured meats or roasted Mediterranean vegetables. Heat a medium sized pan with a ½ teaspoon olive oil and add the diced garlic, red onion and red pepper and cook for 1-2 minutes until just beginning to soften. Next add in the halved tomatoes and cook for a further minute or two. Transfer all the ingredients into a small bowl and allow to cool down. When the mixture has cooled down add in the chopped spring onions, parsley and olive oil and mix well. Season lightly with a little salt and pepper. Meanwhile heat a large griddle pan until smoking hot. Use a little of the olive oil to brush each side of crusty bread and char grill on each side until the bread is toasted. 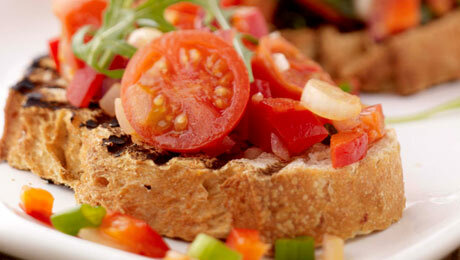 Place the grilled bread on a serving plate and top with the tomato based topping.